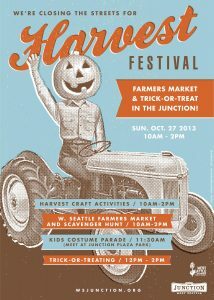 Our Sunday farmers market will take the streets bringing the fall harvest and more. The West Seattle High School Marching Band will lead a children’s costume parade at 11:30 am. Junction businesses will host Trick-or-Treat starting at noon (not before). The last important piece is the Harvest Games and Activities brought by our neighborhood’s awesome non-profits, churches and businesses. Home made games and crafts are the best! We already have 18 applicants and if your group would like to provide a FREE activity at the Harvest Festival, please fill out the application here. Deadline for submission is October 1st. We are also looking for volunteers to help close the street at 6am (coffee included:) and at 8am to help direct the activity providers. Please sign up here! It feels good to help make something awesome for our community.